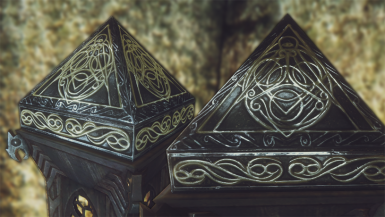 Retexture & remesh of the Divines' shrines to an HD look with finer detail and alternate color schemes. Port of mod with same name for Oldrim by Rengel, retouched by LupusHegemonia. 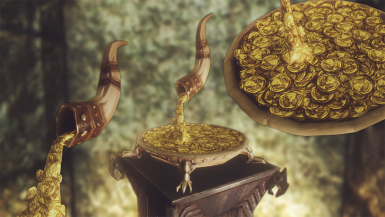 All art work was done by Rengel for the mod by same name for Oldrim: https://rd.nexusmods.com/skyrim/mods/50327/? 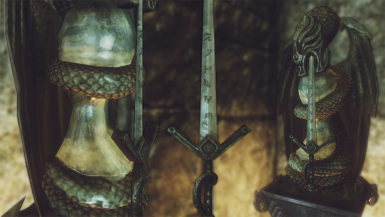 After receiving Rengel's permission, I merely converted meshes and textures to the new SSE formats and uploaded the archive. 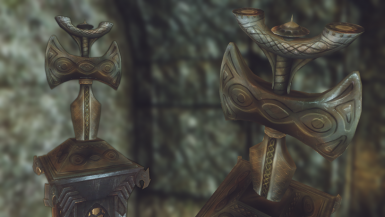 For the 2K version, textures were retouched and upscaled by LupusHegemonia. 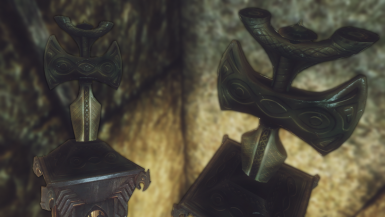 This mod used both textures AND meshes so please install them else they won't work properly! 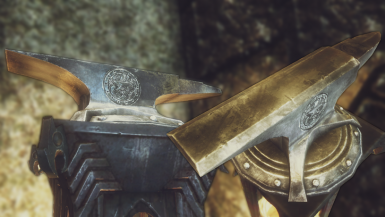 Ren-Detail: The engraving on the sword reads 'Bormahu' which means father to the dragons; thought it would be a nice little detail. Life and death, and its endless cycle. 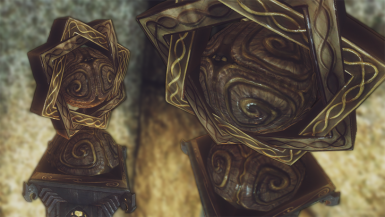 It didn't really hit me at all when I looked at the shrine in vanilla. 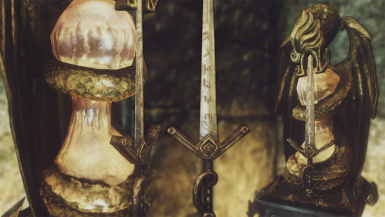 I have to admit her shrine is quite nice in vanilla, however I think detail gets lost in its monochrome style. Aedra of beauty, love and lust (some say), I decided to use more bold colors. purple and finally ends in pink, demonstrating its delicate femeninity. 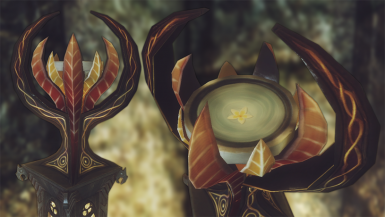 Ren-Detail: Inside the pink petals, rests the water vessel. I added a little green leaf floating on top of the water. 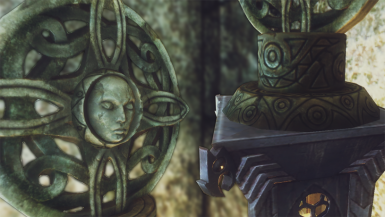 any idea what kind of entity is being worshipped. 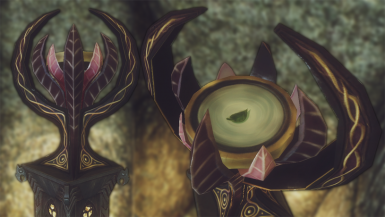 Ren-Detail: If you play around with your view, you will notice that it's actually very glossy. 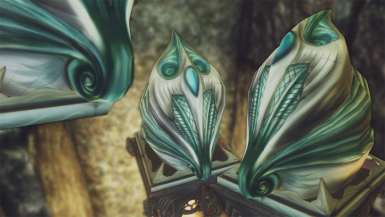 Ren-Detail: You can see at the base, on the front and on the sides, little bluish-green wings that add to the overall detail. detail. 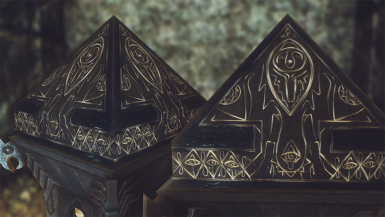 A lot of detail. 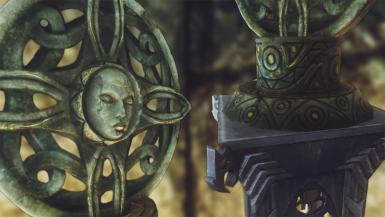 Ren-Detail: I made mara's intricate background have a see-through feature. The vanilla version only had a black background. vanilla seemed too plain to go hand in hand with its quirky model. sits is silver with little claws supporting it. 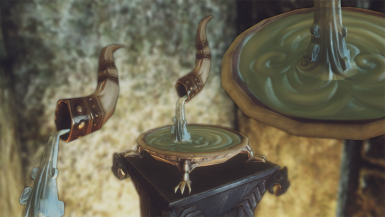 Ren-Detail: The stream of water coming out of the horn is actually transluscent. a sword, didn't really scream mighty or strong at all. Was too dull. blade a different color and more luminescent as to show divine power. 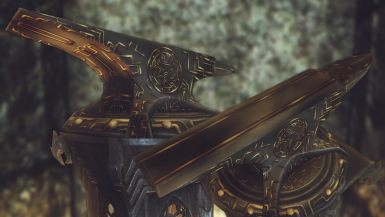 Ren-Detail: The Carved symbols at the base and hilt, and the golden design along the blade. 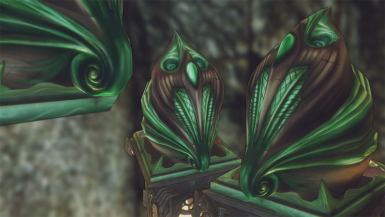 Works with any mod that uses the shrines, but not mods that edit them. If you got a Texture Pack that edits the shrines but you want to use mine, just overwrite them with my files. If using NMM, it should be straightforward enough; else, extract the contents of the folder into your data folder. If it prompts you to overwrite anything, it means you have a mod that edits the shrines. Now comes with a Fomod Installer so you can choose a mixture of original, alternate and vanilla shrines to your liking! !